Holy. Crap. Yep, I just noticed I am totally and utterly alone in a forest in Canada with not a soul in sight and this sign comes into view, like someone quickly attached it to a post and ran away… Wildcat spotted in area. Love the pictures to show you the differences between cougars, bobcats and kitties–duh! 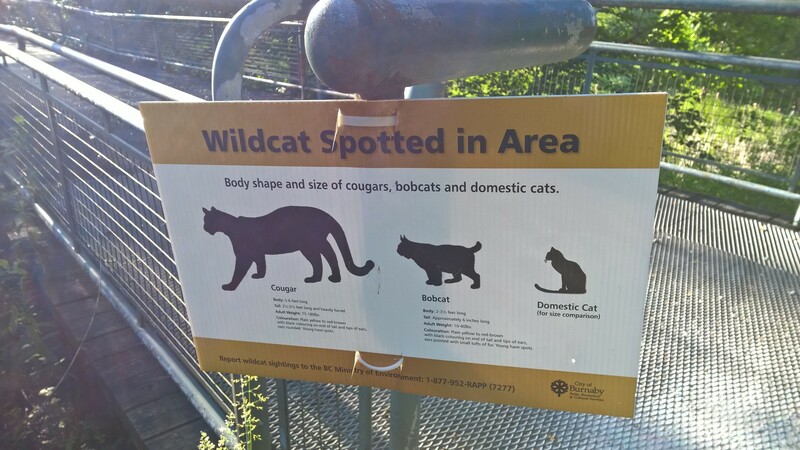 If you are that stupid and need a pictorial of the differences between a cougar and a cat, you deserve to get f&*king chewed on like a kibble. Just saying…. Looking around and, again, seeing nothing but trees, trees and more underbrush where that damn cougar could be hiding, I channeled my inner Hunger Games heroine and picked up an insubstantial branch to defend myself with and took off as fast as possible. 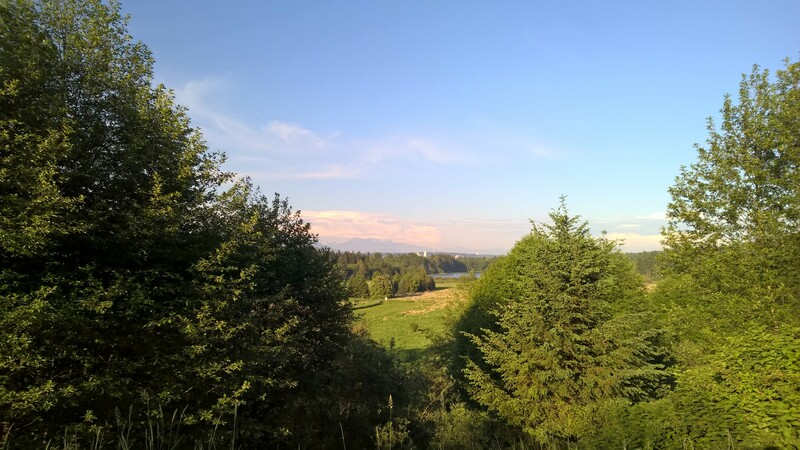 Deep in the forest by a lake in Burnaby, this was my “peaceful” stroll to get in my 10,000 needed steps to make my new Fitbit animate, aka it rattles on my wrist when I hit my goal. Happy times staying fit and alive. Eventually, I ran out of the forest into suburbia and found my way back to the hotel in one piece, feeling fit to live another day and vowing to stick to the urban jungle from now on instead of the actual jungle. The kicker was that my Fitbit wasn’t working right so it didn’t even record my steps including the long climb back up the hill to home. DAMN! My calves are aching and telling me I hit that 10,000 step goal so we’ll just go with that unofficial count and charge it up for tomorrow. I got my Fitbit for Mother’s Day and am enjoying challenging myself to get out and get walking even more than usual. Especially when I’m on the road working, it will get me out of the hotel in the evening and onto the streets. Last night when I got into Vancouver, BC, I immediately took off on the skytrain from Burnaby where I’m staying to downtown Vancouver. Only taking 20 minutes, it beat driving in traffic. After a lengthy wait to get through customs due to Victoria Day traffic, I was done with driving. I wandered through Gastown and enjoyed people watching. Lots of buskers playing their songs and people eating outside enjoying the warm weather. 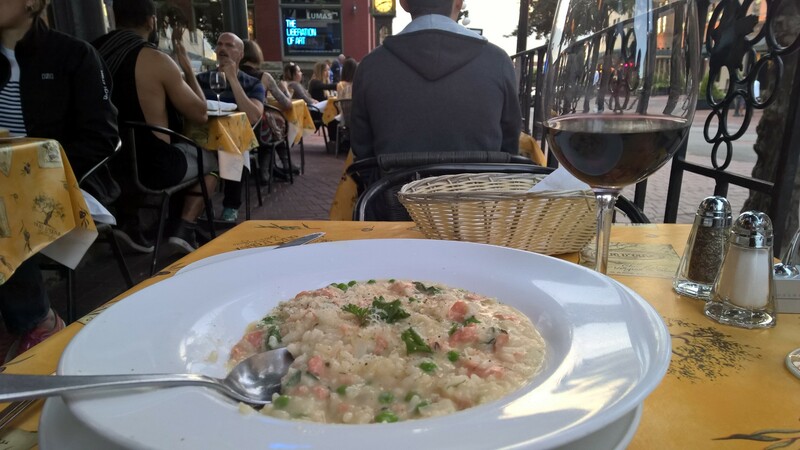 I finally settled in at the Water St. café and enjoyed amazing salmon risotto. Seriously, I almost licked the plate–crazy American that I am. Washed down with local wine, I was happy, happy to walk back to the skytrain and join the crowds returning home. Arriving back at the hotel with the Fitbit working, it synced and told me I had about 100 steps left to goal. Did I run in place and rack up those last few steps??? Oh yeah-BAM! 2 days and 20,000 steps and feeling good… my Type A personality likes hitting goals and my body likes the workout. Win-Win! Busy week filled with challenges, both work and fashion. What exactly does one wear to work on taxes?? January is all about dieting and taxes–oh boy what a fun month! Trying to squeeze into those tight jeans and squeeze out some money while you’re at it. I. HATE. TAXES. Having to track down all the forms and document my crazy messy financial life for the last 12 months is HELL. This year my taxes will be super complicated with living in China AND the US, several rental properties, selling some land and starting two businesses. 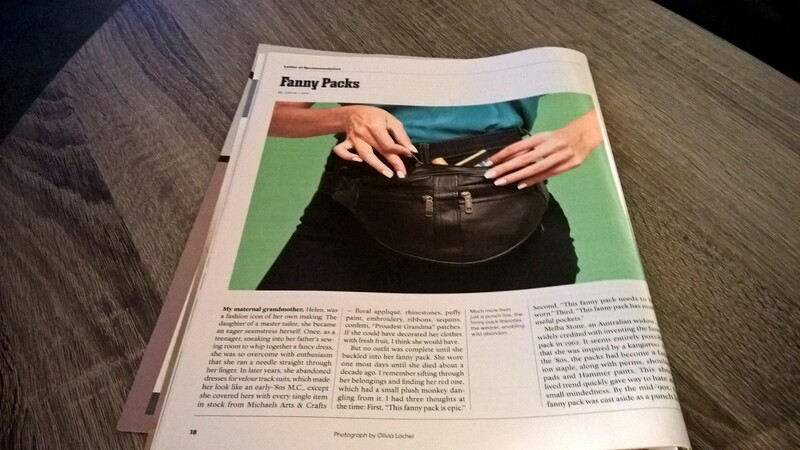 Wait, what’s that loud noise….I think I just heard my accountant’s head explode. Luckily, I have company assistance this year and then next year we go back to Thom’s childhood friend Ronnie who always has done our taxes. I wish everyone luck as we all wade through trying to make sense of it all. DAMN, Where’s my wine??? 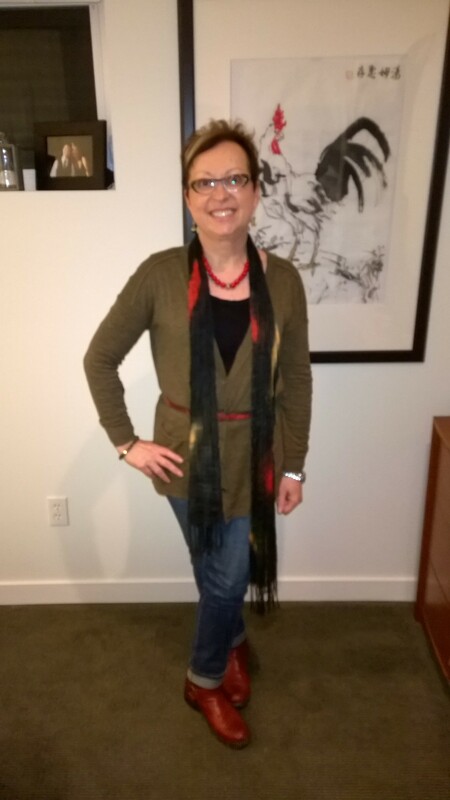 So, fashion was fun this week as I get to the end of the month of my fashion challenge. Yes, I do have too many clothes and look forward to my beautiful daughter Hannah visiting so she can raid my closet and take some with her. More room for new stuff! Let the shopping begin. 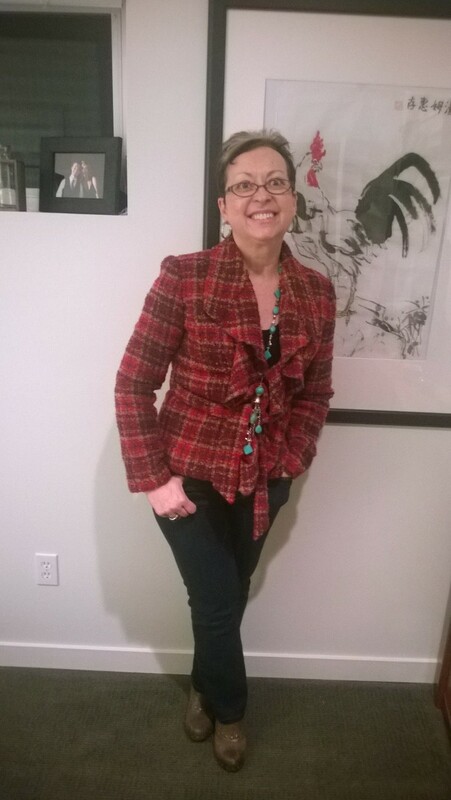 It’s been good to push myself out of my rut of wearing the favorite stuff week after week. I’ve enjoyed seeing how I can combine new pieces with my endless supply of scarves and necklaces. 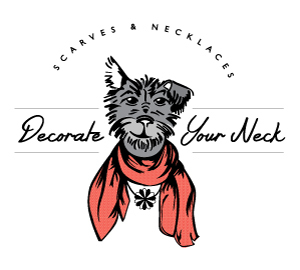 Starting my new online business, Decorate Your Neck, is a lifelong dream realized. I look forward to placing my Spring order soon and bringing even more fun and affordable necklaces and scarves to customers everywhere. I’m still working on a marketing plan but know that this is the business I was always meant to run. No one loves accessories more than me! 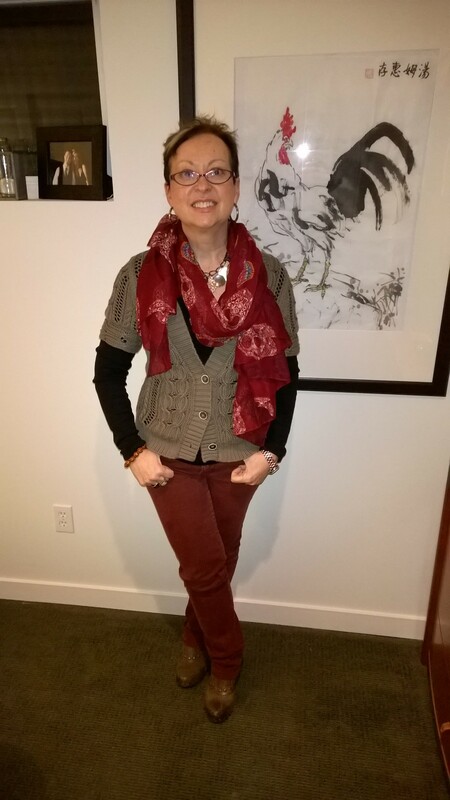 One day I put together a sweater that I found at a thrift store with my burgundy skull scarf from my store and favorite burgundy jeans with studded shoes. 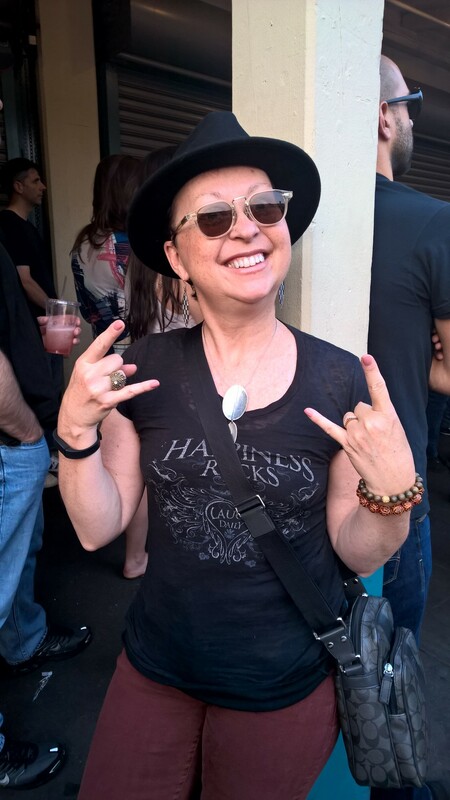 My boss remarked that I was channeling the 60’s, which was slightly insulting, but whatever… she’s the boss, right? I’m all for people wearing whatever they feel good in and not judging so I’ll just take that as a backhanded (way, way back) compliment and move on with my fashion life. I wore jeans ALOT this week because I was in meetings where everyone was very casual. I’m looking forward to rocking the heels, skirts and pearls next week. Watch out, Dallas, here I come! I travel for a couple of days, back for a week to end the month and then off to sunny Scottsdale, after the Super Bowl where the Seahawks WILL WIN. Those Patriots have all kinds of bad underinflated karma blowing in their direction so I’m fairly confident that the honest team will prevail. GO HAWKS! Days 14-18 of the Fashion Challenge were a challenge. No excuses but between a trip to Canada, being assigned an additional “stretch” assignment on top of my other job, blah/blah/blah….it didn’t leave time for writing, one of my true joys in life. So, I’m back now and ready to rock the fashion challenge in the upcoming week. 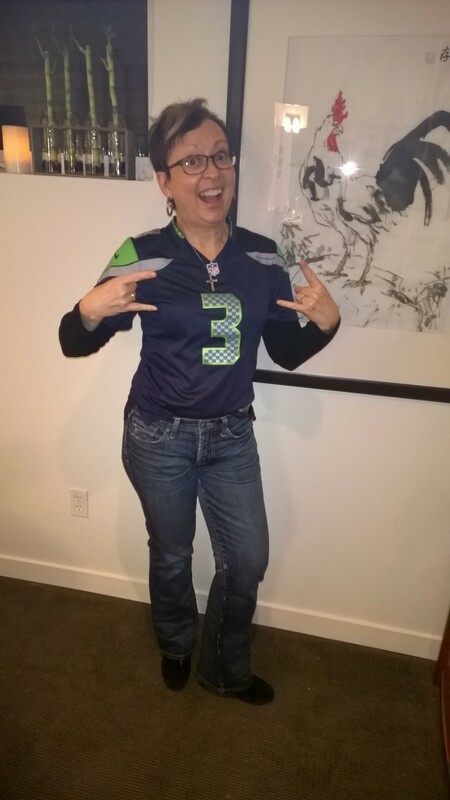 Today, however, I didn’t even get out of my PJ’s except to throw on my Seahawks jersey to watch the most amazing football game ever. Lesson reinforced from the come-from-behind story of the Seahawks is that you must never, EVER give up. Russell Wilson crying and praying on the sidelines made me tear up as well and his inspirational post-game discussion highlighted how, despite playing truly horrible for most of the game, he kept a positive attitude leading his team to the win when it would have been easier to give up or make excuses. I hope the Seahawks do win the Super Bowl just to recognize their teamwork and dedication. Oh, and we hate the Patriots and Tom Brady as well. Arrogance doesn’t play well with me. Wearing my green custom made shirt from China! But, on to fashion. I don’t have any fashion tips to share today except to say that EVERYONE needs to have a “PJ only day” once in awhile and not bother with getting dressed or leaving the house. Though I did work all day on my new project, at least I was able to do it in my own beautiful cozy home surrounded by my love and my puppies and comfy as all get out. 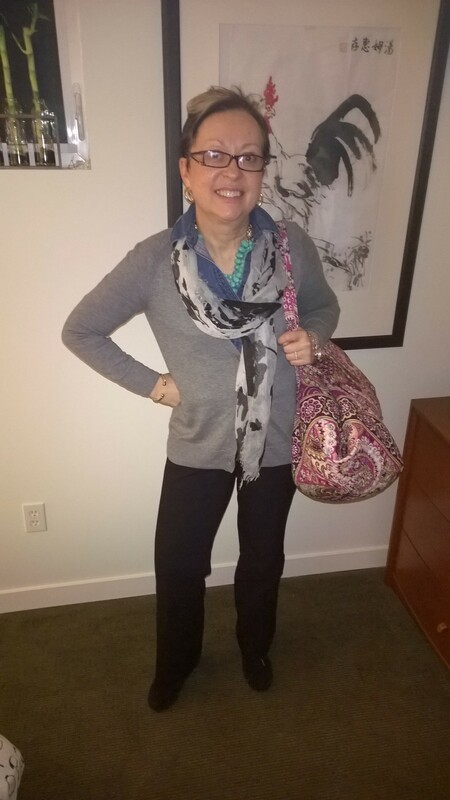 But earlier in the week after I made my way back from Canada, I did manage to dress appropriately wearing new fashion outfits from my too-packed closet. I especially loved wearing the green knit shirt that I had made to order in Shanghai. 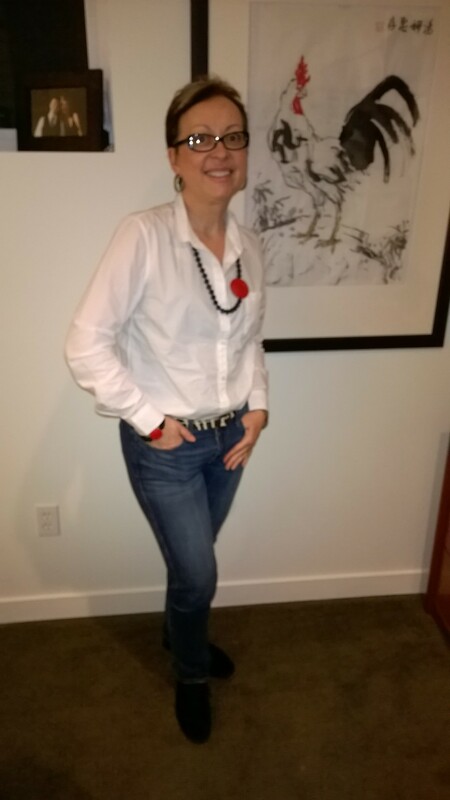 For only $20 US, I took in my favorite Michael Kors shirt and they replicated it for me with a few modifications in the fabric/colors I picked. I only got green and black and wish I had gotten more colors while I was at it. 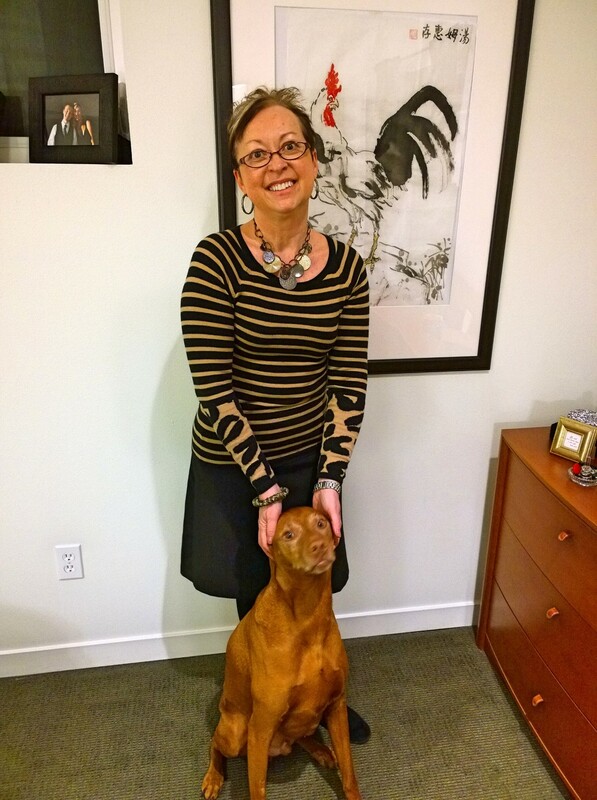 It fits like a glove and is so flattering that it is my “go to” shirt to make me feel good for important meetings. Of course, coming home to my puppies at the end of the night and cuddling makes all my stress go away. I highly recommend “puppy therapy” if you are having a stressful day or just need some unconditional love. When life gets too busy and you forget what’s important, the wagging of a tail and nuzzle of a cold nose will set you on the right path again. Life is short but puppy love knows no bounds. Thank goodness for dogs! Back in the USA! After a few days in snowy and ridiculously cold weather in Canada, I’m wondering why ANYONE lives there… really??? Parkas and big thermal boots would have to be your fashion statement for months on end…. OH. HELL. NO. If there is ever another trip to Canada in my future in the winter (which I certainly will try to avoid) then, note to self, pack some F*@king Boots. I packed my one of a kind, expensive, handmade boots not my ugly Uggs. Mistake, big time! They had smooth leather soles that didn’t work too well on the ice and snow. My only other packing choice of shoes were heels. I’m an idiot. So, I walked carefully and looked forward to getting back to warm Seattle. At 50 degrees, it is like summer down here vs. Edmonton’s North Pole-like experience. Brrrrrr……. Of course, Izaak is the best part of this picture not the outfit. He is a big hunk of cuddle muffin who likes nothing better than laying his head on my neck so he can feel my pulse and get cozy. I do miss all my guys when I travel. It sounds glamorous to those that don’t have to do it very often but life on the road is challenging at best. Last night as we raced to Vancouver’s security and then customs to get back to the U.S. only to stand in line fretting if we would make our flight (we did by 2 minutes) I kept my co-worker calm when the TSA dude let through a whole group ahead of us because there flight was leaving 5 minutes before ours–these days if you complain too loudly, they will just ban you from the flight for being contrary. Watch your words and action and always be polite… you get more with honey than vinegar! 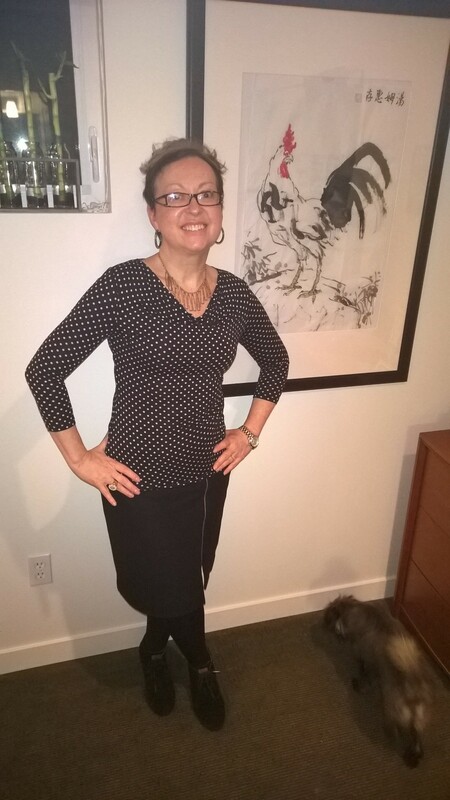 So, first day back in Seattle, I brought out the stripes with animal print accents in the form of a warm Banana Republic sweater with a classic black skirt and tights. Best part of the outfit was the chunky and clunky necklace that turned the outfit into interesting vs. boring. It makes crazy noises when I walk but I like it. Sometimes, you just have to walk loud and proud! I have a standing desk at work now so the Rockport stiletto booties only lasted part of the day and then I had to change into flats to finish it out. Always be prepared with flats just in case. I am hoping that standing most of the day will be healthier for me in the long run vs. sitting…. can’t be worse, right? Just got back from the gym and now settling in to watch American Idol (yes, I’m one of THOSE!) and get more work done. I know I shouldn’t work so hard but I always feel I need to work harder than anyone else to be successful. Probably not true, but I have a family to support, so off I go!